Holiday paradise in the garden of Germany. Whether for holidays or short breaks - the Alemannenhof is always a good choice due to its central location in the beautiful Markgräfler Land region situated between the Black Forest, Switzerland and the Alsace. Nature and culture - you will find plenty of both in this border triangle. Walkers are attracted to the wonderful wine trails. 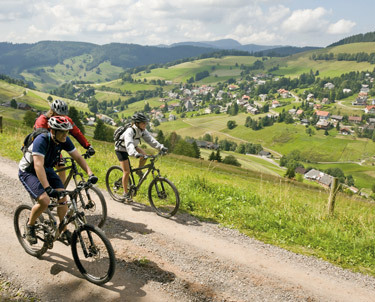 Cyclists treasure the vast tours of the Rhine Valley, Kaiserstuhl and Black Forest. Bikers can find beautifully extended, winding roads with little traffic all around the Alemannenhof. Golf, tennis, paragliding as well as bathing and sauna areas can be enjoyed within close proximity of the hotel. If you are looking for horses or equestrian sport, these can also be found close to the Alemannenhof. A riding school is located just a few minutes away from the hotel. Ideal for children.